My first “real” bicycle was built by Sun Cycles, of Birmingham (not to be confused with the present Taiwanese manufacturer). Sun was part of the larger British Cycle Corporation, swept up in the Tube Investments merger of 1960. My bike was one of the last to display the Sun crest before the marque was neglected into oblivion. I traded my treasured Hofner “semi-acoustic” guitar for this entry-level racer. And so it was, that I became a bike nut instead of a Beatle. My beloved Sun—on which I learned to suffer, in the South Shropshire hills—stayed behind when I moved to Canada. 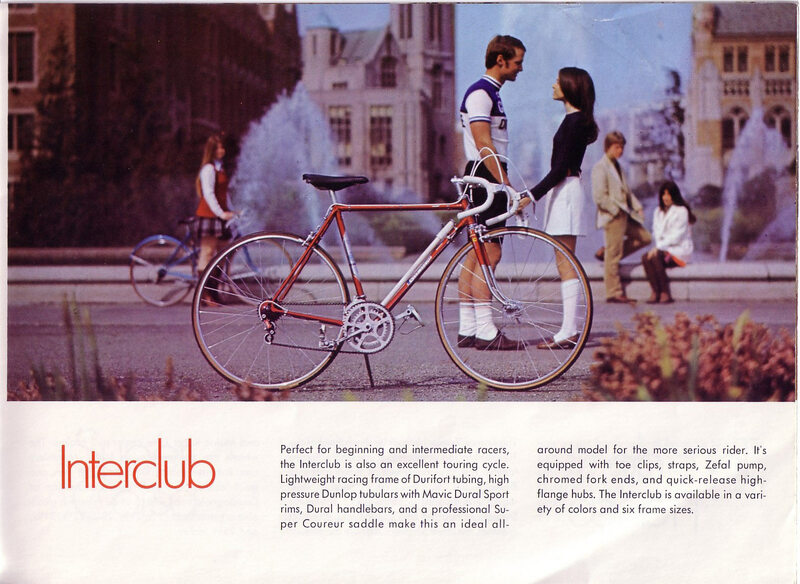 In the late sixties, European “racing bikes” finally caught on in Canada. I bought a Gitane Interclub from the store where I worked for $1 per-hour, assembling the exotic thoroughbreds fast replacing the CCMs on the sales floor. I rode this bicycle on my first crossing of British Columbia. Unfortunately, I let it go for $200 in the mid-seventies, to replenish the dried bean stash in my log cabin, deep in the Purcell Mountains (tubular tyres weren’t exactly suited to hiking trails). In 1978, I bought a Nishiki Landau frame from one of my colleagues at Nippon Cycle, in Vancouver, B.C. It had been modified as a fixed-wheel city kamikaze “cruiser,” but I finally had a new derailleur hanger brazed on and built it up as a touring machine. It remained my main transportation for over twenty years and saw me through my first randonneur events. It now has pride of place on my trainer. We occasionally go out on a date. Read about our adventures here. Rocky Mountain Bicycles joined the list of sponsors who helped launch my 1994 “Three Borders Tour” through Alaska, Yukon and British Columbia. A hand-built, chrome-moly steel “Blizzard” and a custom fork (with low-rider braze-ons) carried me on a 2 month odyssey, over 3600 kilometres of bumpy northern roads. With a few more modifications, it has even served as a randonneur machine on which I completed a basic “Super Randonneur” series of 200, 300, 400 and 600 kilometre brevets. Here it is in all its incarnations. In the early summer of 2006, I ordered a custom-built Marinoni Ciclo. Based in Lachenaie, Québec, Marinoni offers the opportunity to choose design, paint scheme and, if needs be, geometry to fit individual body size—a must, in my case. In late 2007 I launched a new project, to test the touted advantages of the 650b wheel size. This long-neglected French standard is said to provide the momentum of the larger 700c road wheel, yet leaves room to design for the comfort of larger volume tyres. The Rivendell Blériot offers plenty of clearance and very relaxed frame angles. The model is now (summer 2008) in limbo—Rivendell having decided to discontinue its production. I guess I have a collector’s item. I have a Sun Wasp cycle built about 1935 for my father.. it has Sturmy Archer 4 speed gears and I still use it today.. my Father used to race with Wolverhampton Wheelers. That’s cool, rog! There’s catalogue pictures of the Wasp at the Classic Rendevous link above. I believe mine was a Manxman, but it had Mafac Racer brakes. The Wheelers were (are?) a great club. I was a “schoolboy” aspirant for a short time, before coming to Canada. Did you see my essay on cycling in Wolves? Veloweb is such an amazing web site. really couldn’t thank you enough. Great Stuff. How to adjust a Benelux dérailleur!